It may be the first product from Vuly that isn’t a trampoline, but the 360 swing set is already receiving industry recognition. 360 was recently awarded a Good Design Selection® for Product Design, Sport and Lifestyle. Winning alongside the new Thunder trampoline, 360 is the fourth Vuly product in as many years to receive this highly respected award. The Good Design jury called the 360 swing set a “delightful product”, which is a “shining example of what good design can bring to a cool idea”. They said that the end result of the extensive Vuly industrial design process was a “beautifully resolved product that is innovative and so much fun to use”. When we first looked at the slate of play sets available for kids on the market, we weren’t impressed. Just like the trampoline industry a decade ago, the swing and play sets being sold to Australian families lacked design finesse and were constructed poorly – without the future in mind. We saw plastic, thin steel and plenty of nuts and bolts, and we knew that the wider outdoor play industry needed the Vuly design philosophy! 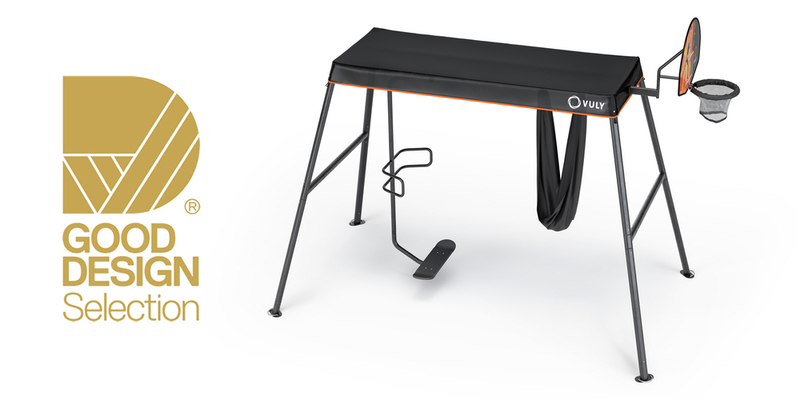 We applied the same Vuly aesthetic and build quality that we have to our trampolines to every element of 360. From the more heavy-duty steel – galvanised and powder-coated matte black – to components that just click together. We also paired 360 with a Shade Cover that’s even more durable than the Shade Cover on our trampolines. It’s made from the same material as our hardy Jump Mats, and those are tested for 40,000 bounces and 10,000+ hours in the Australian sun! Our key values include the belief that things don’t have to stay the way they are and the commitment that we will never create a product that is inferior to any existing product. With 360, Vuly has designed a play set that uses swing modules completely unlike any other on the market. The Spin Swing and Yoga Swing give kids the freedom to surf, twist, relax and even try acrobatics – all in the backyard! Every family’s needs changes over time. Vuly also recognised that more parents are looking for products that they can both customise today and modify later on. There’s no reason that a swing sets should be a product that we throw away in a few short years; it should be an investment that stays with you. The sizing and swings on 360 are totally modular. Want to move from an Medium to a Large? It’s only an Upsize Kit away! Vuly is also releasing a number of options – from the Nest Swing to the Classic Swing – that are all compatible with the slots on every 360. 360 may be a Good Design Selection®, but its journey isn’t over yet. It and Thunder are both up for the prestigious Good Design Award®! The jury of industrial design experts presented the original Thunder 1.0. the award in 2014, and now Vuly has the potential match or exceed that in 2017.